The PDF Association exists to promote the PDF file format and the conference is a chance to hear from many speakers and catch up with what is going on in the PDF world. 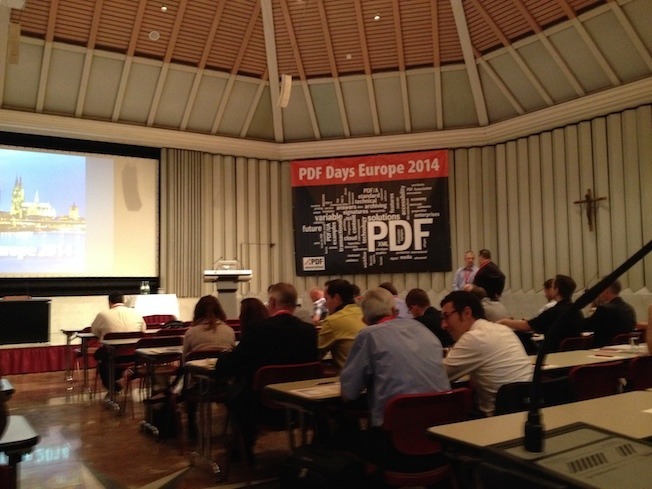 7 minutes with a PDF standard saw a whistle stop tour of the current and future plans for the PDF file format, the new PDF 2.0 format and the subsets of PDF targeted at different uses (PDF/A, PDF/X, PDF/VT, etc). Did you know that the PDF file format contains references to other technical documents? While the growth in digital has hit traditional publishing, a big growth area in printing is packaging so developments are being added to PDF to support this market. After coffee, the conference split into a choice of 3 Tracks with a Beginners track, a more advanced track and a track with speakers in German (as English is not everyone’s language of choice. Advanced users had a talk on issues with PDF files and one one PDFBox (which also mentioned issues with PDF files), followed by a look at PDF Rendering. German users had a selection of talks on PDF/A, mobile PDF and PDF for emails. The day closed with a summary of sessions followed by food, beers, and Germany v. Portugal on the big screen. Details of the conference are on the PDF association site and they will hopefully post the talks on their youtube channel. Tomorrow is part two of the conference which is also running alongside the IText conference.